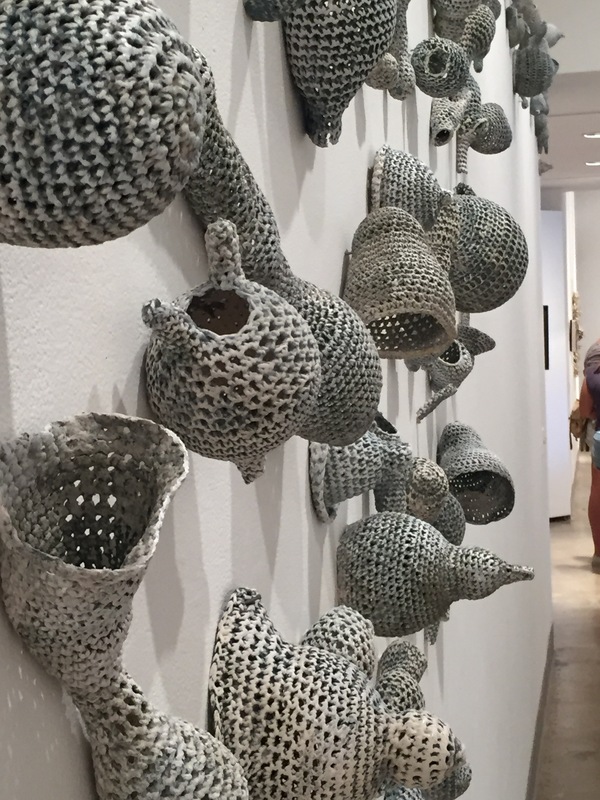 The Kellogg University Art Gallery at Cal Poly Pomona delights art lovers with Ink & Clay 42. Artists explore both media in a variety of forms and — whether by curatorial design, artistic coincidence, or some other joyous trick of fate — tackle visions of utopia and dystopia in a contemporary context. 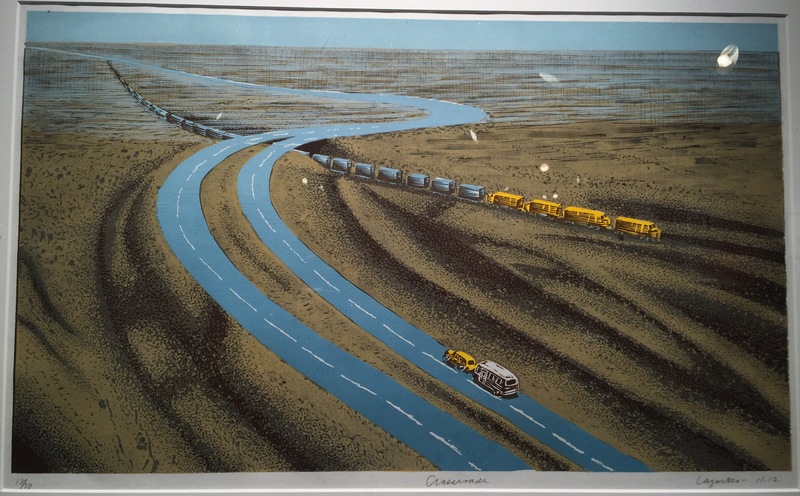 The ink works, including the Juror’s Choice Purchase Award Winners, David Avery’s No. 2 and No. 4 from The Coming of the Cocklicranes series, and my own Pulse, provide the darker view. 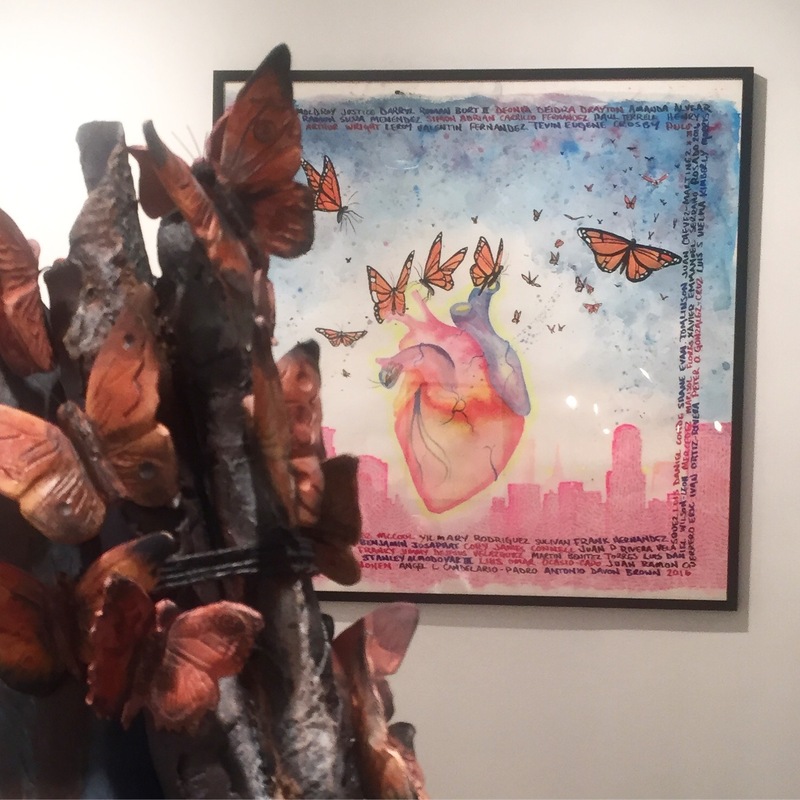 From the lonely paths in Anthony Lazorko and Edgar Ivan Rincon’s woodblock print, Crossroads, to the dual views of Colleen M. Kelly’s Naked Under Her Clothes pieces, the ink works challenge by asking viewers to engage with the unexamined. 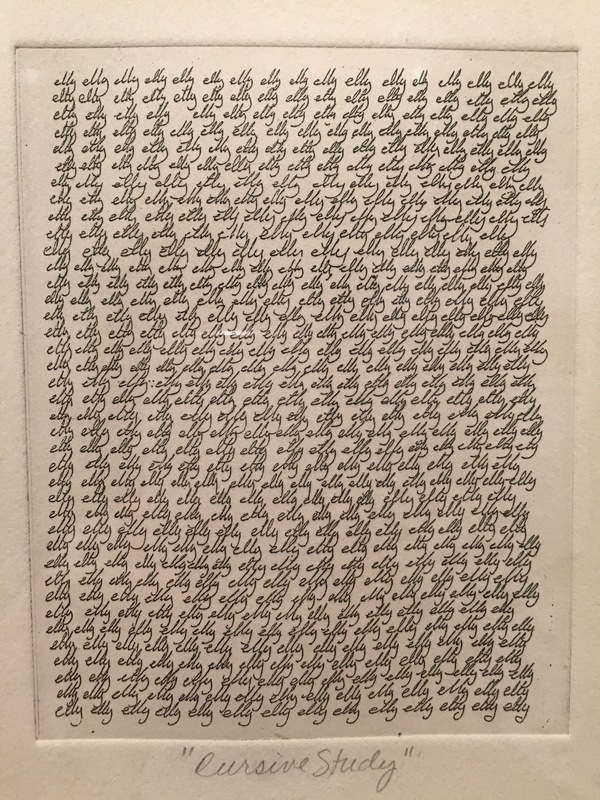 Indeed, Kelly’s Cursive Study, which received on of the Juror’s Choice ink awards, is a beautiful testament to the dying art of handwriting. The flicker of Roland S. Escalona’s Close Quarters is more reminiscent of a perpetual storm of life, even in its electric patterning, than it is of the light one might seek in life. And though the crisp, white, neatly cut row-houses huddle close, they ultimately feel cold, the individual lost in a hegemony of enforced sameness. As a counterpoint, the clay works were often delicate, bright, and reflective of hope and promise. Meriel Stern’s showstopper, Domestic Flow 3, an installation of porcelain ‘basket’ forms, is beautifully reminiscent of the sea. It’s undulations, structure, and color are both wave and whale-like, while the subtle blue gray swirls mimic microscopic life. You wish to fill each precisely hung vessel with whispered memories. Similarly, Ethan Snow transports us to a bright and mechanical future; the pastel pinks, golds, and whites in his porcelain ‘idols’ have both the whimsy of space-fantasy and the thoughtfulness of form. Snow’s Central won the Curator’s Choice Honorable Mention. 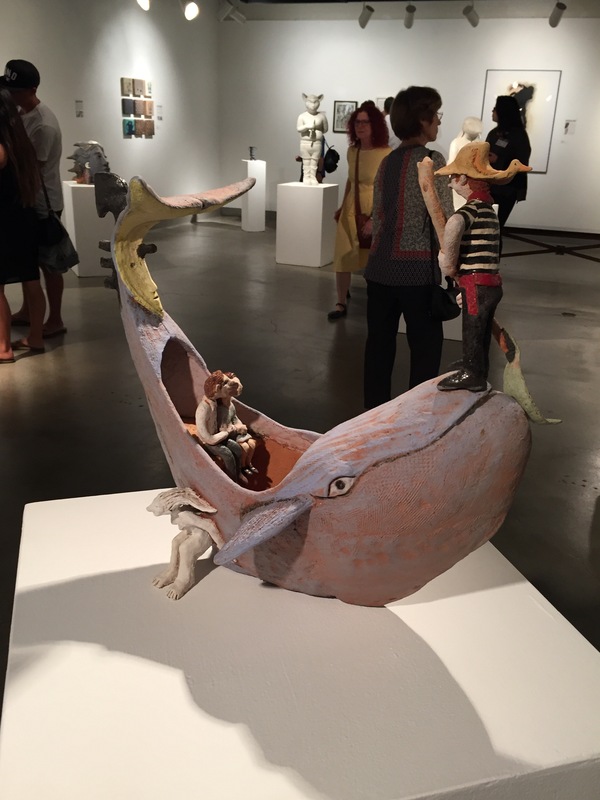 Whimsy was also on display with Gina Lawson Egan and Annie Nguyen’s latest works. Both artists, staples of the Ink & Clay exhibitions, delight with new stories and characters in their familiar creative styles. Not all ink works were dystopian, such as Barbara Foster’s woodcut, Telltale Signs, and not all clay works were hopeful. Pascual Arriaga’s Exposed is a truly sobering sculpture that reveals as much as hides. Overall, the exhibition delivers on its long running promise for fine art. There were a couple of misses for me but I’m honored, once again to be among such a talented cast of artists. 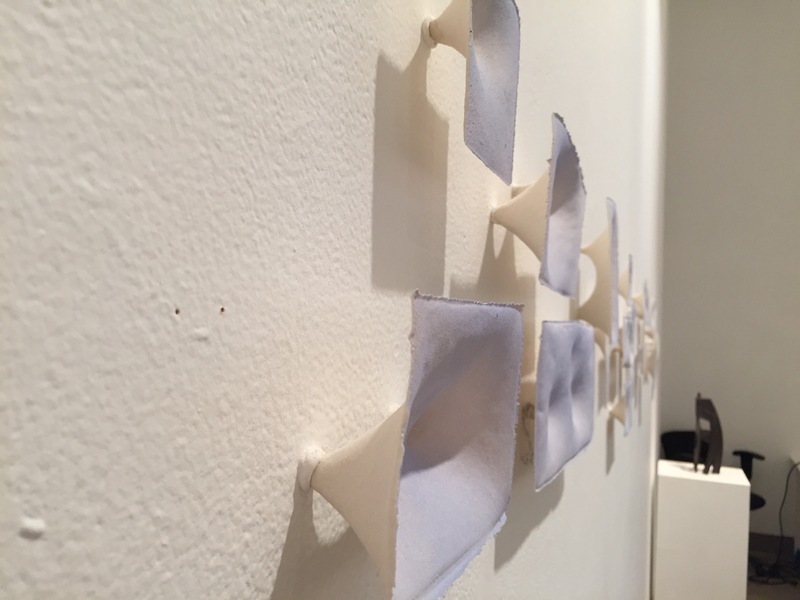 From virtual reality to porcelain quality, Ink & Clay 42 is an excellent destination for art lovers. Peter Mays, executive director of the Los Angeles Art Association and Gallery 825, served as curatorial juror alongside Denise Kraemer and Patrick Crabb, who served as jurors for ink and clay works respectively. 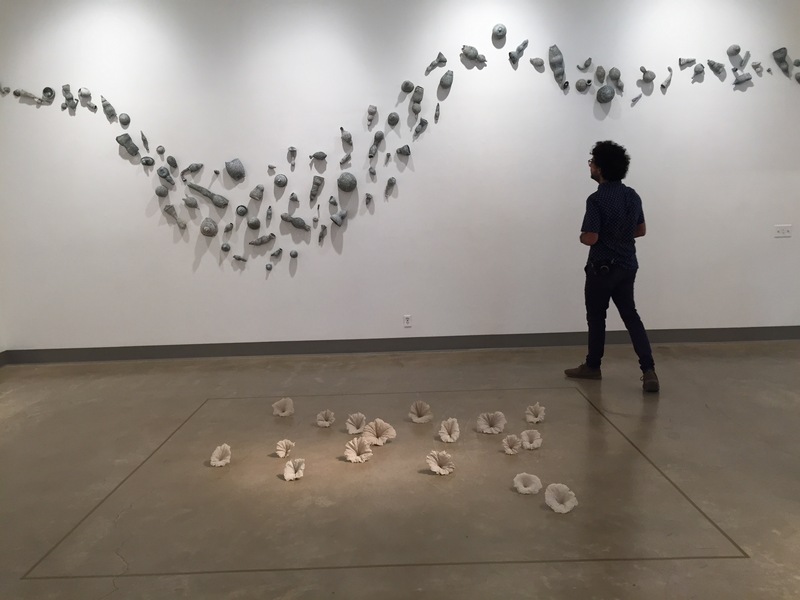 The exhibition, which was curated by The Kellogg University Gallery’s own Michele Cairella Fillmore, runs through October 27, 2016. 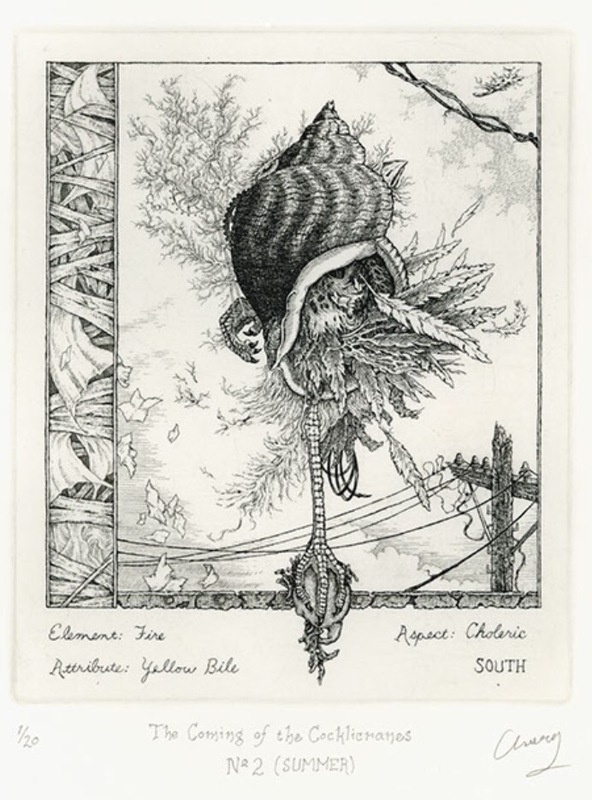 You can view all the works, including mine, on the Ink & Clay 42 site. Update 10/19 – I had wrongly spelled Meriel Sterns name, misnamed Barbara Foster, and incorrectly named the shows curator. Corrections are reflected above with apologies.